Import vCard Files to Outlook Contacts with Accurate Details! vCard is the electronic version of business cards, which contains a contact’s complete information – name, address, contact number, email ID, images, audio, website URL etc. Generally, vCards can attached in emails, but are often exchanged over IMs and online networks, via internet. Outlook is a Personal Information Manager that single-handedly handles emails, contacts, notes, tasks, calendars etc. By supporting vCard and vCalendar features, Outlook offers a powerful approach to exchanging data in personal or professional environment, leading to electronic PDI (Personal Data Interchange). Why Importing vCard Contacts to Outlook is Needed ? Users want to save all their vCard contacts at one place, scattered at different applications and digital devices. So what better option than saving them in Outlook. To keep a backup of all their contacts, users need to import their vCard contacts to Outlook contacts. 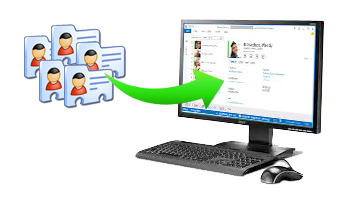 Due to job switching and Outlook used at new office, user may need to save all their important old contacts in Outlook. Is It Possible to Import vCard Files to Outlook Contacts Manually? Yes, Outlook’s Import option allows users to manually import their vCard contacts. But it is limited to importing only single vCard file only at one time. It could be a feasible task for users having a handful of contacts and also having a quality time to spare. But this can’t be said for large quantities of contacts as repeating the same process again and again becomes lethargic and boring. Another problem with Outlook’s manual process is that it only imports first contact of a multiple entry vCard files and doesn’t support subsequent entries. Which means, if you have a single vCard file having multiple contacts, even then you won’t be able to import it in Outlook using its default option. So, What is the Solution for Importing vCard Contacts to Outlook? The solution for accessing vCard contacts to Outlook would be to convert them to .pst format, reason being Outlook saves all its data in PST only. And once these vCard contacts are converted to PST, they get entitled to be imported, viewed and accessed in Outlook. But now the question that arises is how to import vCard contacts to Outlook? vCard to Outlook Converter creates a new PST file which automatically gets imported in MS Outlook 2016, 2013, 2010, 2007 and 2003 editions. Also, the software not only imports vCard files to Outlook PST , but also provides option to Convert vCard to MS Excel and CSV format. Free demo of the software is there to help users know it better. Demo converts first 5 vCards or first 5 entries of a multiple entry vCard, freely. Download and install it on all Windows editions, including Windows 10, 8.1, 8 and all earlier editions.